Today’s free eBook, The Knight Who Wouldn’t Sleep, is a bedtime picture book to help put your little ones to sleep. 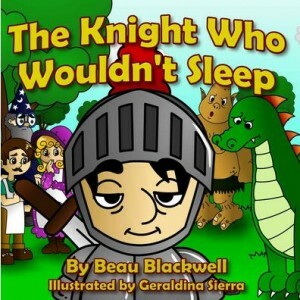 Written by Beau Blackwell and illustrated by Geraldina Sierra, the rhyming story follows a stubborn young knight who suffers the consequences of not going to sleep before battle. A cute, rhyming bedtime book for toddlers, preschoolers, and kids ages 2-7 who don’t want to go to sleep! Our fun-loving knight fights a nightly battle- he fights the urge to go to sleep! As you can imagine, this ends up causing him all kinds of problems until he gets some good advice from his friend the wise wizard. The Knight Who Wouldn’t Sleep is free through Amazon today, Thursday, February 26, 2014. It currently has 4.9 out of 5 stars from 19 Amazon reviewers. For more free eBooks, check out our 10 Websites to Download Free eBooks list, as well as our Free eBook of the Day archive. If you are looking for more children’s book, check out our recommended app of the week: Epic!